I am a day late with this post but I hope that you all had a very Merry Christmas! I'm sure you have all been just as busy as me trying to get everything in order before the big day arrives. This is the first year in MANY MANY years that I didn't send out Christmas cards. This makes me really sad. Each year I look forward to sending out cards. I love to share what I create with my friends and family. Especially at the holidays! Since I was so busy getting ready for the holiday- I didn't really have a whole lot of extra time to spend in my craft room. Now that the holidays are over I will be spending a ridiculous amount of time making lots of new things! 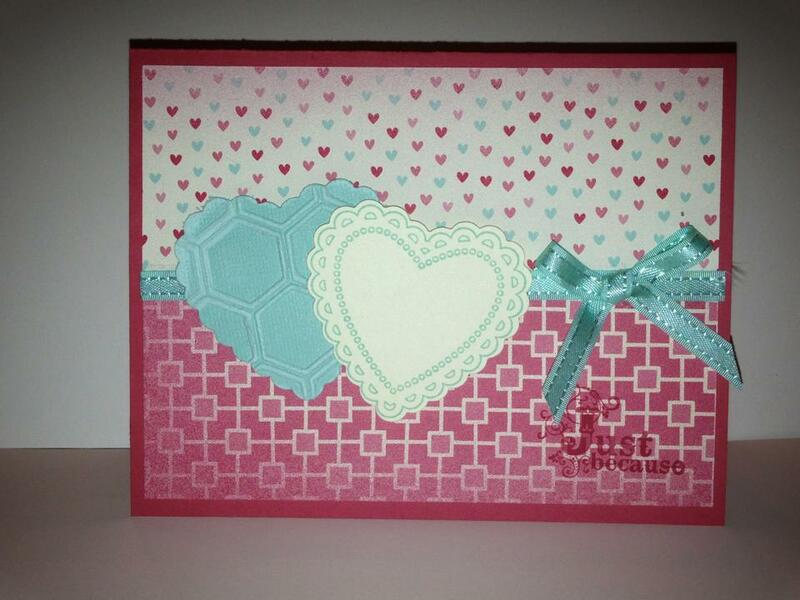 As you can see from the right side bar on my blog- I was one of several Stampin' Up! Demonstrators who were chosen to be a part of the Creative Crew over at www.splitcoaststampers.com. I cannot wait to share all the wonderful creations with you and I hope that you too will play along with our monthly challenges. I will share the challenges as soon as I know what they are! I will also post the link to the gallery once it goes public. Thanks for checking in and I hope you all had a wonderful holiday season! Today- I'm sharing a cute Holiday video from Stampin' Up! The video was created by several very talented people at the home office. I enjoyed watching it and thought you might too! Just wanted to give you a quick update. The Stampin' Up! Clearance Rack has been updated with over 300 new Clearance Rack items with discounts up to 80% off!!! 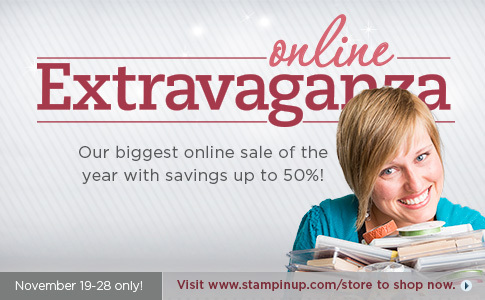 For the first time only- Stamp sets have also been added to the clearance rack at up to 40% off! That's a HUGE bargain! You MUST place your order ONLINE through my online store. Please click the SHOP WITH ME button on the right sidebar to take advantage of the fabulous Clearance Rack! This offer is while supplies last only so hurry! Today I have another sneak peek for you! This card actually has several! The stamp set is called Hearts a Flutter, there is a matching set of Framelits which I used to cut out the hearts (also called Hearts a Flutter), Pool Party Core'dinations Card Stock, More Amore Specialty DSP and the Honeycomb Embossing Folder. The "Just Because" sentiment is from the Vintage Verses Sale-a-Bration catalog and so is the beautiful Pool Party Ribbon. All of these fabulous new products will be available beginning January 3, 2013 (except the Sale-a-bration products which will be available starting on 1/22/13). Please let me know if you would like a copy of the Spring Catalog and Sale-a-bration Catalog. I will get them out to you! It's hard to believe that Christmas is only 13 days away. I've been busy not only baking for the holidays but making Christmas cards and shopping. Aren't they adorable? I filled each one with fruit snacks and candy canes. Normally I would have filled them with chocolates but since there are several students at the YMCA that have peanut allergies I thought that it was best to stay away from chocolate. I hope the kids like them!!! Today I'm sharing another sneak peek! 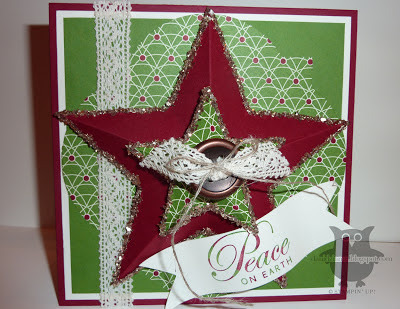 This cute little Christmas Tree is made from the new Stampin' Up! Paper Doilies. The doilies will be available starting January 3, 2013. They are the perfect addition to cards, scrapbook pages, or for other fun creative projects like my tree. The star was created by making two 3D stars and then gluing them together. It's hard to see in the picture but I put glue along the edges and then used the Champagne Stampin' Glass to hide the seams. These little trees are so easy to make and make such cute decorations! Now that baking is over I finally have time to play with all my new goodies from the 2013 Spring Catalog and the 2013 Sale-a-bration flyer. The first card I'm going to share is a card created using a new stamp set called "Oh, Hello". I LOVE it! It's probably my favorite set in the new Spring Catalog. I wasn't sure if I would like it at first but let me tell you- the possibilities are endless with this set. My brain has tons of ideas flowing through it! I paired the stamp set up with the Tea for Two DSP. I love all the colors in the Tea for Two DSP. They are so soft and pretty! I used the new Ovals Collection Framelits to cut out the oval shapes. I know it's hard to see in the picture but the rose was stamped onto the Very Vanilla Card Stock and then I stamped another rose and cut certain parts of it out to give it a 3D look. Thanks for checking in today! Be sure to visit again soon as I will have more Sneak Peek's all week long! I just wanted to drop by and let you all know that I probably won't be posting anything new until the weekend. Every year I do holiday baking for my husband's company so I am extremely busy with that right now. I am in the process of making Snow Globe cookies which look simple but are extremely time consuming to make and decorate. 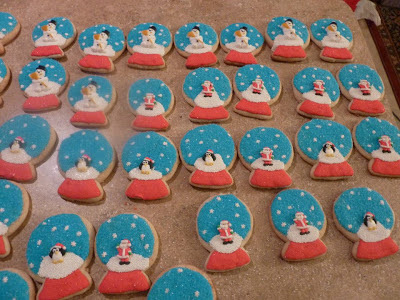 (They are sour cream cut out cookies in the shape of a snow globe and decorated to look like a snow globe that has been shaken up) Tomorrow I am making Buckeyes, Peppermint Melt-away's, Chocolate Walnut fudge, and about 4 other varieties of cookies. Here is a picture of the Snow Globe cookies I made last year. Aren't they cute? Have a great Thursday and I'll see you this weekend with some NEW ideas! Click the SHOP WITH ME button on the right side bar to order yours today! This is a FANTASTIC deal! You get enough supplies to create 10 ornaments with this kit!!! Making each ornament just $1.49! Definitely a bargain! Good Morning! I haven't posted in a few days. Not because I wasn't crafting but because I was in the process of baking and packaging 175 mini chocolate chip cookie cups for a cookie party that I was invited to. I love holiday baking and always make sure that my cookies look nice and pretty! Once I had all the cookie cups baked, iced, and decorated- I put them into little Merry Christmas Kraft Boxes that I had made using Snow Festival DSP and Kraft Boxes. I love the Snow Festival DSP because it's very colorful and not just the traditional red and green. I think they came out cute! The cookie party was a lot of fun and thankfully everyone liked my cookies/packaging. I also won a prize!!! I never win anything! I was SO excited! Now I have a new Holiday Baking cookbook! Can't wait to use it!! !